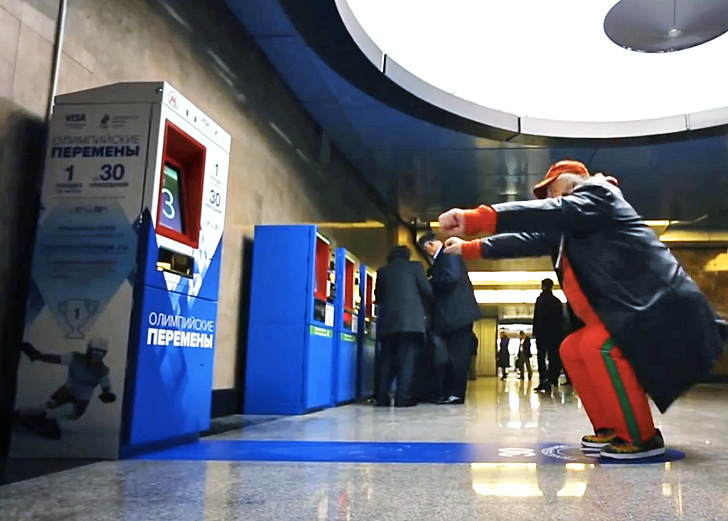 In effort to promote physical fitness and the upcoming Winter Olympics, Moscow city officials are giving commuters a chance to earn a free ride on the subway in exchange for 30 squats. A single ride on the metro usually costs 30 rubles (92 cents), which means each squat is worth the equivalent of one ruble. With just three months to go before the Winter Games kicks off in Sochi, Russia, the government is stirring up some Olympic spirit. Each squat is counted by a special machine marked with the Olympic logo that can be found next to normal electronic ticket vending machines. Commuters simply stand on a mat in front of the machine, which spits out the free ticket once their 30 squats are complete. This fun service is available for one month; the Winter Olympics begins on February 7, 2014.